Humanure composters have tricks up their sleeves. Ever go on a week-long camping trip or to a camping music festival and hate using those awful portable chemical toilets that stink? If you have a humanure compost bin at home, simply take two five gallon buckets with you on the trip. Fill one with a cover material, such as sawdust, and put a lid on it. Set it inside the empty bucket and pack it along with your other camping gear. Voila! One portable composting toilet! When you set up your camp, string up a tarp for privacy and set the two containers in the private space. Use the empty container as a toilet, and use the cover material to keep it covered. Place a lid on it when not is use. No standing in line, no odors, no chemicals, no pollution. This toilet will last several days for two people. When you leave the camp, take the "soil nutrients" home with you and add them to your compost pile. You will probably be the only campers there who didn't leave anything behind, a little detail that you can be proud of. 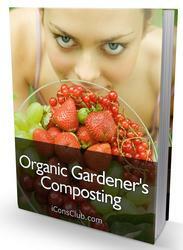 And the organic material you collected will add another tomato plant or blueberry bush to your garden. 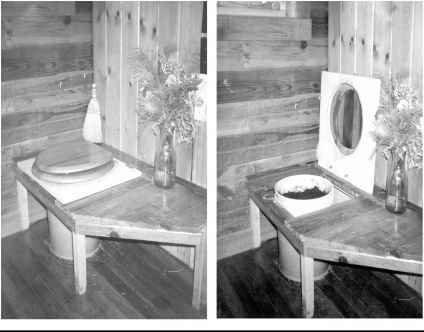 You can improve on this system by taking a toilet seat that clamps on a five gallon bucket, or even taking along a home-made toilet box with seat.